In a blatant display of racism, hundreds of Beitar Jerusalem fans walked out on their own team on Sunday in the wake of the first goal scored by their own Muslim player. Earlier this year, midfielder Dzhabrail Kadiyev and striker Zaur Sadayev joined Beitar from Russian club Terek Grozny amid protests from nationalist fans. One large banner created by fans read "Beitar will always remain pure" and another sign criticized the plan to recruit the two players. The response from the club, Israeli police and Israel Football Association has been admirable with plenty of arrests and a clamp down on the Beitar racists. On Sunday, though, the issue once again came to a head. Only the 23 year-old Sadayev, a big, heavy-set striker, played against Maccabi Netanya on Sunday. In the first half, boos rang around the stadium every time he touched the ball. And when Sadayev scored in the 48th minute, the reaction in the crowd was confused to say the least. In one stand supporters screamed with elation, but behind the goal, around 300 supporters left the stadium in one of the most disgraceful scenes ever witnessed in Israeli football. Sadayev was also given a standing ovation by almost all in attendance after being substituted on 73 minutes, but several dozen Beitar fans greeted Netanya's 77th-minute equalizer through Omri Ben Harush with celebrations, turning against their team. "I felt that love wins and that sport is the important thing and not a man’s religion," said Beitar assistant coach Jan Talesnikov. "We respect every person regardless of his religion. 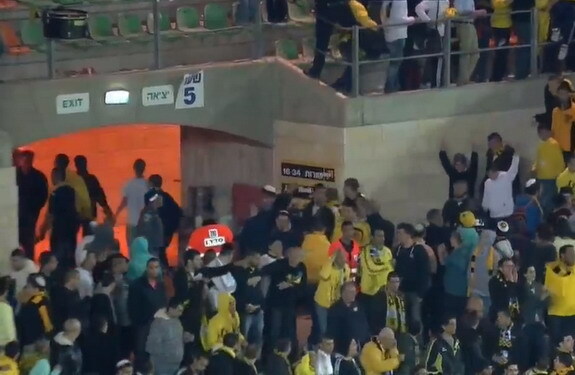 Those fans who stayed in the stadium are Beitar's true supporters." Beitar are a bastion of Israel's political right wing and the only leading team in the country never to have signed an Arab player because of fan pressure. Arab citizens make up some 20 percent of Israel's population of almost eight million. Arab players feature prominently at all other clubs and have long been included in Israel's national team.